If you examine the stats, I mean relax your focus and stare at the stats until you see the image of a saiboat, you'll see that Jose Bautista is having an utterly dominant season. Just think about it, if baseball is a game of failure, Bautista has truly mastered it. He's failing at all facets of the game, offensively at least. If he could find a way to emulate Eric Thames in the outfield, he'd be a complete player. Well done, Jose! So the Jays are in Baltimore tonight and last time they faced each other, the Orioles won 2 out of 3 games. I'm hoping that things turnout better this time around, but it also got me thinking. How is it even possible that Baltimore can have a winning record this late in the season? And I know the answer. It could be because I've recently watched The Wire in its entirety, but I'm convinced that the commissioner has influenced Baltimore's front office to somehow juke the stats so that they come out looking like winners. It's a classic case of short term thinking in the Charm City. This week, we examine what happens if the standings were to be seeded alphabetically. The biggest losers are all the relocated and rebranded teams. Had Miami kept Florida as it's region, it would have been in the top ten. Same with the Angels, who originally were known as the California Angels, would have been in the top five. And they would have been first overall had they kept Anaheim in their name instead of attempting to compete with the Dodgers for the hearts of Los Angeles. 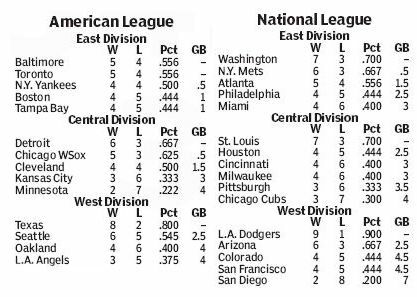 Speaking of the Dodgers, had they stayed in Brooklyn, they also would have been among the top teams in baseball. The biggest loser is the last place Washington Nationals, considering they would have been ahead of the New York Yankees had they stayed in Montreal. This is obviously going to be a record breaking season! The Dodgers are on pace to get 145 wins and the Rangers will be close behind with 130! Too bad for the Padres though, they're on pace for only 30 wins. 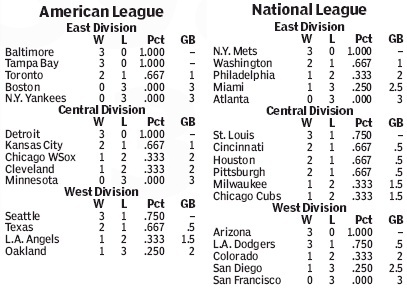 Oooh, and it was so close, but the Orioles will win the East based on their head to head record against the Jays. And what a quick rebuild by the White Sox, getting the wild card after trading away Sergio Santos, Carlos Quentin and Ozzie Guillen? Some smart moves by Kenny Williams.